On Sept. 2 a Brazilian doctoral student, Samantha Palhano, was laboring quietly in the ornithology laboratory of the Academy of Natural Sciences. Located in Philadelphia, the Academy is the oldest natural history museum in the Americas. Its extraordinary collection extends to 18 million biological specimens that have been steadily amassed by curators across two centuries and from every region on Earth. Around 210,000 of these specimens are birds. From mourning doves to birds-of-paradise, each has been patiently acquired, expertly prepared and methodically labelled. Species by species they are laid in dark drawers where they wait, with infinite patience, to answer whatever questions science might one day ask of them. Samantha’s question is an intriguing one: Can the genetic analysis of an extinct bird that was unique to a specific corner of the Amazon rainforest shed light on the region’s ancient biogeography? This is not an abstruse question of interest to few, and of value to no one. Rather it promises to reveal much about the relationships between Amazonian and Atlantic forests, habitat and extinction, biodiversity and climate change. The answers will advance our shared understanding of the past, present and future of the planet. And the answers all lie among the myriad tissue samples that Samantha has been studiously extracting from collections held at both the Academy and her own museum, the oldest science institution in South America, Brazil’s Museu Nacional. At precisely 7:15 p.m. on Sunday, Samantha’s work was interrupted by a brief text message from a distressed colleague in Rio de Janiero. It read “MUSEUM IS ON FIRE.” The full extent of the destruction was revealed throughout the night. By morning it was apparent that the ornithology collection had been largely spared but that others had not been so fortunate. Arguably the widest damage appears to have been the destruction of the museum’s entomology collection, yet in the days since the disaster this has been much less reported. One can only speculate as to why. Perhaps there is a sense that this vast repository of nature can one day be restocked, that what has been lost is replaceable, that it can be seen elsewhere, that nature’s handiwork somehow doesn’t matter quite so much as humans’? If so, it should be a source of concern because, like the birds in Rio and Philadelphia, every significant specimen collection is a boundless dataset that allows researchers to determine a natural environment that has long since disappeared, speculate on a world which has yet to come, and understand the one we currently have. A collection can be restocked, but the scientific value of one amassed over centuries can never be replaced. Nor can it be seen elsewhere. To the untrained eye one Goliath beetle may look much like the next, but to a trained entomologist they can be as individual as the commuters on a train. When compared over time they reveal subtle but important distinctions in morphological and genetic evolution – to lose a vast historical sample, as happened that weekend, is to have obliterated our opportunity to fully understand the largest constituency of life on Earth in what is one of its most biologically diverse regions. While the relatively small number of significant specimen collections amassed among the world’s principal museums sometimes overlap, their relationship is more often symbiotic, having evolved over decades to depend on the existence of each other in a delicate global ecology. Like the lifeforms they encapsulate, collections are interconnected, fragile and easily destroyed. Worst of all, they are taken for granted. While Samantha can continue her life’s work, her senior colleagues have lost theirs forever. And while Brazil will feel the tragedy most keenly, we should be aware that its scientific impact will undoubtedly affect us all. This blog post humanizes a horrific event , and keenly expresses the loss that every citizen of the world can understand. What has been done to the Academy of Natural Sciences of Drexel University so that similar disaster doesn’t kill your museum? 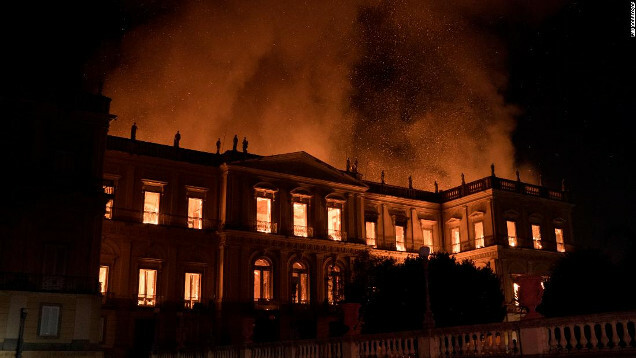 I read an article that many museums in the US are a ticking element as have no preventive measure from fire like Brazil’s case. Thank you for your concern. The Academy has in place fire safety systems and emergency procedures that guard against a similar tragedy befalling our collections and exhibits. Our Academy staff engages in annual safety training, fire drills and other safety tests that are part of the larger safety protocols of Drexel University.